Salmoriglio is a classic Sicilian sauce for grilled fish. It's always made with freshly squeezed lemon juice and extra-virgin olive oil, and lots of fresh thyme or oregano. The flavors are bright and sharp, but clear enough to let the fish it sauces come through. This version includes the briny bite of salt-cured capers. Salmoriglio is especially good with grilled albacore tuna. Coarsely chop together the garlic, thyme, and parsley. Put in a blender. Add all the remaining ingredients (except the capers) to the blender. 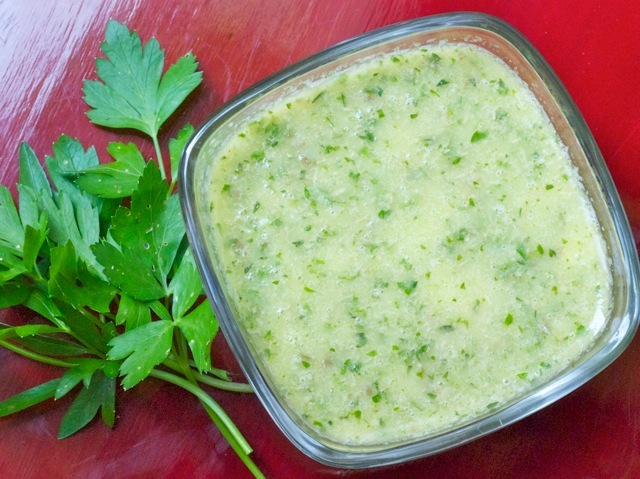 Blend until the herbs are in tiny pieces and the sauce is a pale yellow-green color. Add the capers and blend very briefly, about 10 seconds more. Serve the sauce at room temperature, spooned generously over grilled fish.